A mere 2 million email accounts existed in 1985. By 2001, there were 891.1 million (Chittenden & Rettie, 2002). By 2019 5.6 billion email account would have been active (Statista, 2018). Email-marketing-reports.com (2018) reported, there are 247 billion emails sent every day. The importance of email marketing is highlighted with how often we use it to communicate. So, it is important that emails stand out and go to the right people. Making the wrong choice when it comes to marketing emails can lead to a business’s email being blacklisted and blocked (HubSpot, 2018). Ryan (2016) defines personalisation as a way of engaging with customers on their own terms. Postma and Brokke (2002) add to this and state personalisation is sending the right message to the right customer in order to increase effectiveness if communication. Chaffey (2016) teaches customer engagement is a method to increase the amount of time to attention a consumer gives a brand across multiple chances. Thus, personalising an email campaign for a customer, and making it into an experience will allow leave a memorable impression. This is a phycology backed method, it’s called the Baader-Meinhof Phenomenon (Arnold Zwicky, 2006) and this is what an email campaign should aim to do (Chaffey 2016). 21% of consumers reported that they’ve received a memorable promotional email in the past two months, according to a study by Litmus (2018). To overcome that, many brands are using email personalisation as a strategy for creating more engaging email experiences. Personalisation came derive in many forms, location, name, and even demographic. 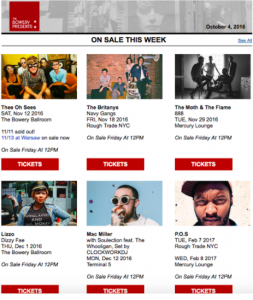 The Bowery Presents is great example of how to use location information to provide a customised email experience. In the email, The Bowery Presents pulled shows from New York venues for living in this area. Hawaiian Airlines; In keeping with the Hawaiian tradition of presenting someone with a lei on his or her birthday, the airline presented a gift of bonus miles, just for booking a trip within the next year. Along to enhance the chances of a memorable email; Personalisation is the best method to use to keep emails welcoming and renewed. Putting the extra effort into this will in return increase customer retention and build a trustworthy relationship with customers according to Linda (2010). 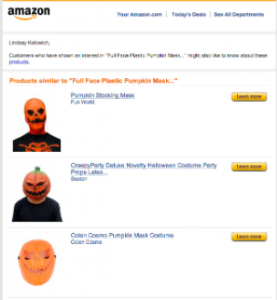 Amazon is an example of how personalisation can be welcoming and renewed, within just a couple of days of purchases amazon will send personalised emails featuring “products similar to ……’ in this example its ‘full face plastic pumpkin masks’. This type of personalisation will not only convert a customer but it makes the content fresh and interesting! While these methods look impressive by companies who have done this well, Pavlov et al. (2008) argues that marketing messages are lost in background noise with negative consequences for return on investment. Gautier (2002) strengthens the argument and discusses the difficulties in measuring the response of email marketing and states how measures such as click throughs are not effective, therefore having the budget for giveaways or spending the time in personalise can be a risk due to the nature of the difficulty to measure email campaigns. Personalisation is a risk to individuals who like to have privacy on the internet, some could feel racked or watched, Harrison McKnight (2001) states trust is a vital relationship to have between business and consumers. The challenges facing organisations are also evident in legislation, General Data Protection Regulation (GDPR) makes it against the law to track or set cookies without consensual agreements (ICO, 2018). Chaffey (2016) teaches effective marketing involves inbound and outbound email marketing. Therefore, although personalization is a massive part of creating the Baader-Meinhof Phenomenon effect, outbound marketing should not be ignored. There you have it, I’ll leave you with this great video! D Harrison McKnight, N.L.C., 2001. What trust means in customer relationships: An interdisciplinary conceptual typology. International journal of electronic commerce, 6(2), pp.35-59. HostPapa Blog. (2018). Benefits & Risks to Email Marketing Selection. [online] Available at: https://www.hostpapa.co.uk/blog/marketing/email-101-benefits-risks-email-marketing-selection-small-businesses [Accessed 1 Mar. 2018]. Ico.org.uk. (2018). Cookies and similar technologies. [online] Available at: https://ico.org.uk/for-organisations/guide-to-pecr/cookies-and-similar-technologies/ [Accessed 1 Mar. 2018]. Pavlov, O., Melville, N. & Plice, R. (2008) “Toward a sustainable email marketing infrastructure.” Journal of Business Research. Vol 61, Issue 11. Smart Insights. (2018). A practical guide to website personalisation | Smart Insights. [online] Available at: https://www.smartinsights.com/digital-marketing-strategy/a-practical-guide-to-website-personalisation/ [Accessed 1 Mar. 2018]. Staff, P. and Staff, P. (2018). There’s a Name for That: The Baader-Meinhof Phenomenon. [online] Pacific Standard. Available at: https://psmag.com/social-justice/theres-a-name-for-that-the-baader-meinhof-phenomenon-59670 [Accessed 1 Mar. 2018]. Todd, J. and Todd, J. (2018). Personalization: Your Surefire Strategy To Increase Customer Engagement. [online] MarTech Today. Available at: https://martechtoday.com/personalization-surefire-strategy-increase-customer-engagement-153641 [Accessed 1 Mar. 2018]. Zantal-Wiener, A. (2018). 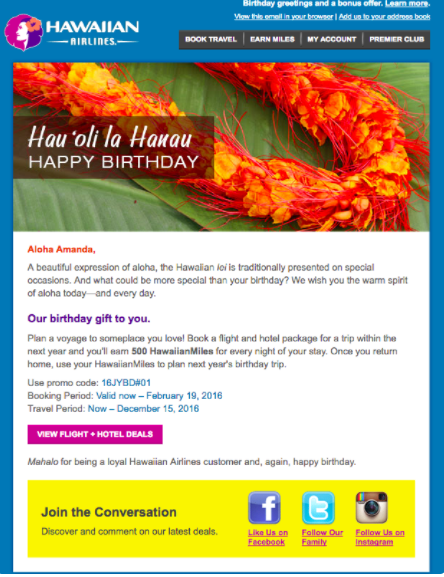 13 Email Examples That Totally Nailed Personalization. [online] Blog.hubspot.com. Available at: https://blog.hubspot.com/blog/tabid/6307/bid/34146/7-excellent-examples-of-email-personalization-in-action.aspx [Accessed 12 Mar. 2018].